Sencha Tea is the most popular of all Japanese green teas. If you have ever had a cup of Japanese tea, there is a great chance you have tasted this one. This is a tea made up of rolled, dark needle-shaped tea leaves. It is a favorite among green tea drinkers for its sweet and astringent flavor. But what makes it so dearly loved? Well, each tea leaf is packed with many nutrients and a great aroma, ready to be infused whenever you need a nice cup of tea. This tea stands well on its own or is at the base of dozens of green tea blends. Sencha is a tea that you can drink and enjoy every day and reap a world of health benefits at the same time. Now let’s head to Japan and take a deeper look at this great tea. Come and fill your teacup with Sencha green tea! Sencha, meaning "simmered/infused tea" in Japanese, is the most produced green tea today in Japan. But when and where did it all begin? This tea was brought to Japan over from China in the 17th century. Prior to this the Japanese mainly drank powdered green tea, known as matcha, which is still available today and is considered quite healthy, too. Sencha is a type of tea with many varieties and flavors depending on the processing of the tea leaves. Let’s follow the journey of these beautiful Japanese tea leaves. Sencha is a tea that grows under direct sunlight and the leaves are picked throughout the year either by hand or machine, a technique mastered by the Japanese with great precision to render wonderful teas. 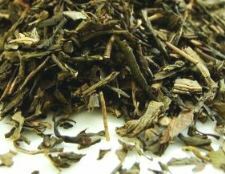 Sencha Uji is considered an imperial tea, highly prized for the long history in tea production. Sencha ariake is a sub-variety unique to the Kyushu island and it is considered to be the sweetest of all Senchas. 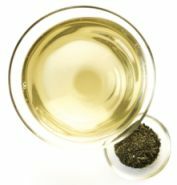 How is Japanese Sencha different from Chinese green teas? Unlike Chinese green teas that are pan-fried, the Japanese developed a technique of steaming the tea leaves to stop oxidation. This helped to preserve both the deep green color and astringent flavor that is unique to Japanese tea leaves. After being rolled, shaped and dried the sencha leaves obtain their unique flat needle shape and are then ready to be sorted into groups according to their quality. One particular variety stands out in the world of Sencha. Shincha – this is the first flush of Sencha tea, picked in early spring and considered the best of all varieties of this tea. It is a bright green and sweet-flavored tea. Depending on the quality, Sencha is prepared varying the amount of tea, the amount and temperature of the water, as well as the steeping time, but every time you will get the refreshing taste of a Japanese green tea. The delicate process that brings sencha from the tea plant into your cup is one that provides you with a wonderful drink and a dose of the best benefits of tea to be had. Sencha is a blend of good flavor and health. Sencha leaves that are picked in spring are full of the nutrients that winter has helped to enrich the soil with. These nutrients include amino acids, sugars and catechins that are responsible for the world of benefits infused in each cup of tea you drink. Rich in green tea antioxidants, Sencha is the perfect tea to protect you! More effective than vitamin C, these powerful allies reduce the damage caused by free radicals and help fight viruses and bacteria. Drink this tea every day and you are sure to feel stronger, healthier and even younger. Give it a try and your body will happily thank you! Sencha tea will help you fight cancer. Tea is a wonderful ally that boosts your metabolism and blocks the growth of the enzyme – urokinase - necessary to the development of tumors. Again, green tea antioxidants, namely EGCG, are extremely powerful in preventing damage to your cells and degeneration of your DNA. This tea will protect you and your family. 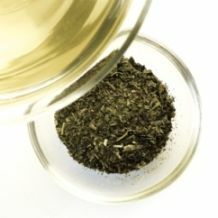 Sencha green tea is a mild stimulant that will enhance your focus and relax you at the same time. Caffeine in green tea gives you the extra energy you need in the morning. It is a great coffee alternative, because it keeps you alert but also calms your nerves, leaving you with a clear mind to get on with your work. Here’s a good tip: After a hard and stressful day, take a soothing hot bath. To make it even better, put Sencha leaves in a soft bag bellow your shower head and let the water pour over it. As you inhale its scent, it will make you feel amazingly calm and relaxed. Having trouble with high cholesterol and blood sugar levels? This may be the right tea for you. Unsweetened, it is wonderful to lower blood pressure and bad cholesterol. Your sugar levels will stabilize and its ever present antioxidants will also reduce the risk of cardiovascular diseases. Looking for a healthy weight loss tea? Sencha tea is a good choice to balance with a healthy diet and plenty of exercise. Green tea antioxidants will increase the rate of your metabolism thus making you burn fat faster. It is healthy, safe and a pleasure to drink! Remember to take it unsweetened. Here’s a tip: drink it in morning, before heading off to school or work to get your day off to a good start. Drink it again with healthy meals, low in fat, to digest your food better. And then once more to keep you hydrated when you work out. Sencha tea leaves contain fluoride, which will do wonders for your oral health! It will reduce cavities, plaque formation, bacterial infections and give you fresher breath. Rising with Sencha tea is a smart option, especially if you run out of toothpaste or happen to be at work. Don’t worry, just rinse with it and smile. Your mouth will feel fresh and healthy! Green teas can help you and have many other health benefits that will give you plenty of reasons to smile! Have a closer look at the green tea health benefits page and discover more interesting facts about this tea. Welcome this Japanese tea into your life! Like any other green tea, sencha tea has caffeine. So if you drink too many cups a day it is possible that you could experience hypertension, anxiety, irritability, nauseas, tremors, heart palpitations and frequent urination. Sencha has a low level of caffeine (30mg per cup of tea) which might mean that you could drink as much as you like and feel little difference. However, tolerance to caffeine depends on factors like your weight, your metabolism or your caffeine drinking habits. So don’t be surprised to find that you have a slight headache if you are not used to sencha or any caffeine at all. Please limit your caffeine intake to two cups a day and be sure to consult your physician to better understand your needs in this important stage of your life. Now it is time to prepare your perfect cup of sencha green tea! Let’s begin. The Japanese cast iron teapot is the perfect teapot for brewing your Sencha tea. It is perfect for infusing tea leaves. Serve your tea in white porcelain cups so you can appreciate the color of your beautiful tea. Always use spring water when preparing your tea. It will ensure that the taste of your tea won’t be altered. First rinse your tea cups and teapot with hot water and discard it. This will help the tea to stay warm longer. Boil your water up to 70ºC (158ºF). With each steeping add 5ºC until you reach 80ºC (176ºF) and increase steeping time. Place 1-2 large teaspoons of tea per cup, inside your teapot. Allow the leaves to steep for 1 to 2 minutes, at most. The key to get the best of your green tea is low temperature and short steeping time. Adjust these guidelines gradually to your own taste and preference. Now take your time to observe the leaves unfolding and dancing before your eyes. Smell the floral fragrance and be enchanted by the long tradition of a yellow-green Japanese tea. Pour your tea into the tea cups and savor its robust flavor with slight bitterness. As you adjust temperature and time of steeping, you will get a variety of different flavors from your sencha: cooler water will give a mild tea, hotter will give a more astringent tea. This is a good tea to have at meal times. It works well with strongly flavored meals, seafood, saltwater fish, vegetables and Italian dishes. If you are looking for a nice drink to refresh you in those hot summer days, you can also brew this tea cold. One way to do it is to pour cold water over your tea, and leave in the refrigerator for 2 hours to brew. 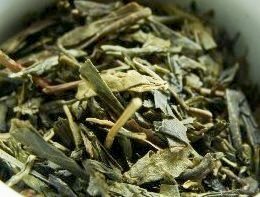 Whether you are looking for a medicinal tea or just enjoying the pleasure of drinking an aromatic and delicate drink, sencha green tea may be the perfect tea for you. 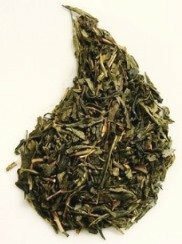 Buy Your Sencha Green Tea Today! Click on the image or on the link below to purchase from Art of Tea your organic Eisai's Choice Sencha. This traditional Japanese green tea is a favorite that you will never forget. Has a tasty grassy flavor that will invite you to meditate and relax. Buy your Eisai's Choice Sencha Tea here! Enjoy each cup of your Sencha tea!